We’re Randal and Melissa, and Brown’s Professional Tree Service is our family business. We’ve lived in Gympie our whole lives and are proud to be part of this community. When you choose us, you’re choosing to contribute to the local economy in Gympie, helping other locally owned and operated businesses like ours to flourish. In the past 12 years that we have been offering our tree service, we have had the pleasure of getting out and meeting many locals. As a result, we have a great relationship with our community, and our services are known as first-rate and reliable. 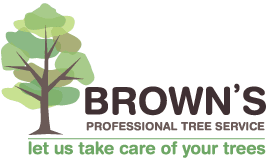 At Brown’s Professional Tree Service, we’re about more than just cutting down trees —we are known for taking extra care with Gympie’s trees. We are passionate about, and genuinely care about the health of the trees in our community. Randal has a genuine passion for gardening and trees, and this passion is reflected in the service we offer, with Randal treating each property as though it was his own! We use our expert knowledge to maintain great tree health and do our best to avoid removing trees unless it’s absolutely necessary. Our first priority is always you —our customer. We will go above and beyond to provide an excellent service to you, taking the time to find the best solution for you, your trees and your property. We never cut corners, and remain ever reliable and professional. Every one of our services is offered at an affordable price, simply contact us to arrange a quote!